Need it by Wed. Apr 24th? Just order by 2:00PM PST tomorrow and choose expedited shipping during checkout. We have many combinations of blade widths and pitch from the smooth cutting raker tooth to the efficient skip tooth and the aggressive hook tooth styles. 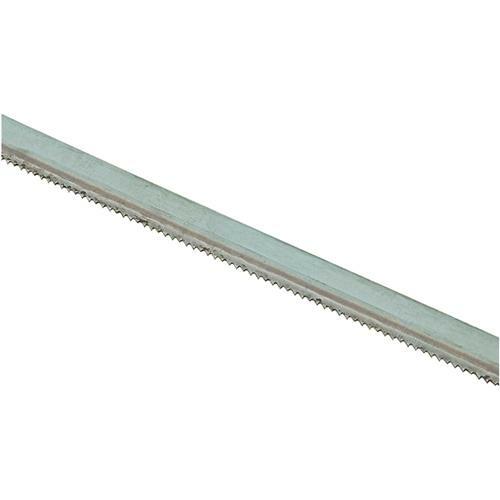 Top quality saw steel manufactured to precise tolerances and guaranteed welds result in very smooth cutting blades. Blades are sized to fit Grizzly bandsaws as well as many other brands. Just match up the length in the charts with the recommended length for your bandsaw. If you need more information to help match blade cutting characteristics with your particular applications, just call our friendly service technicians. 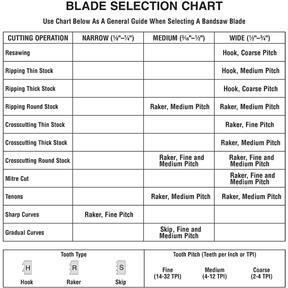 Blade Selection: Selecting the right blade for the cutting task requires knowledge about blade characteristics and cutting priorities (i.e. speed, finish, etc.). Blade Length: Measured by the blade circumference, blade lengths are specific to each bandsaw. They are determined by the wheel diameter and distance between the wheels. Blade Width: Measured from the back of the blade to the tip of the blade tooth (the widest point). Blade width determines the largest and smallest curve that can be cut, and contributes to the accuracy of cutting straight—generally the wider the blade, the straighter it will cut. Tooth Set: Two common tooth sets for wood bandsaw blades are alternate and raker. Each type of tooth set removes material in a different manner, leaving cuts with different characteristics. Alternate: An all-purpose arrangement where the teeth are bent evenly left and right of the blade. Raker: Three teeth in a recurring group—one bent left, one bent right, and one that is not bent. The raker set is ideal for most contour cuts. Standard (or Raker): Equally spaced teeth set at a “0” rake angle. Recommended for thinner workpieces and general use. Hook (or Claw): Wide gullets (round or flat), equally spaced teeth, positive rake angle, and fast cut with good surface finish. Skip (or Skip Tooth): Wide, flat gullets, a "0" rake angle, equally spaced teeth, and recommended for thick wood cutting.